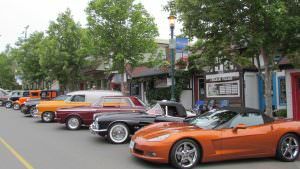 Every year Seaside Cruizers Car Club hosts a weekend of events in Parksville & Qualicum culminating with the Father's Day Show 'n Shine in the town of Qualicum Beach. Our Sunday Show 'n Shine is such a great show that it was mentioned on the Oprah Winfrey Show as one of the 10 best things to do on Father's Day. During the Show 'n Shine the whole town is wired for sound and music from the 50's and 60's. There are trophies galore and lots of prizes are given out to spectators so listen closely to the Emcee at the main stage. You could be a winner! The town will be wide open with many local restaurants and shops along with service clubs and vendors ready to accommodate your shopping, food and refreshment wishes.